Hey Boeing! It was a total blast to be part of your event in St. Louis. As a surprise to you, (How Cool is That!?) here’s a brief follow-up video to remind you of some of the fun stuff we covered when we were together on Last Tuesday. Here’s an ethical bribe: leave a comment (scroll down and leave it below) and tell us what YOU are doing or thinking differently based on our time together and I’ll send you a gift. No silly….not a crystal bowl. But it’s fun. It’s free. And it’s my treat. Here’s a very casual (which translates to “I made it with my phone!”) video I created in the St. Louis airport just for you. Thanks again… and don’t forget to comment. Cheers and thanks. Thanks Boeing. It was my distinct pleasure! Have a great day….. and don’t forget the bribe: leave a comment below about what you learned and are doing differently and I’ll send you a treat! Hi friends it’s Brad Montgomery from Bradmontgomery.com. I put together a special video just for you because I wanted to thank you for all of your time and attention today. But also to remind you of what we covered today because I know since then you’ve had some difficult times, you’ve had like what, 10,000 emails, all kinds of emergencies, let’s see if we can’t remind you how to connect happiness to your bottom line. Because remember the concept was that if we enjoy our time at the link we are going to be better and more productive and more efficient, more effective at Boeing. So how do we do that? You know how. Remember all that fun we had this morning? 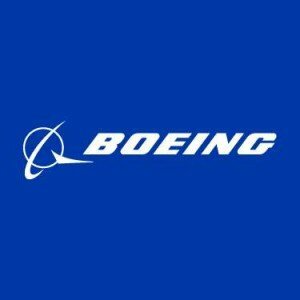 The laughing and the joking and the carrying on, that feeling is to go, you’re job is to bring it back home and especially bring it back to Boeing because it will make it you better and because you know how. Here’s the 3 points we covered this morning. First, I want you to find happiness. Find things that remind you that life is good. I mean how cool is it to work for Boeing? You’re involved with the space shuttle. You know, you see planes landing every single day that you guys have a piece of supporting. How cool is that? How cool is it that you just finished up a really cool administrative admin week, how cool is that? How cool is it that you’re getting a reminder video from a guy, Brad Montgomery that you’ve already forgotten about? How cool is that? I’m at the airport in St. Louis getting ready to take off to go home and it’s going to be a Boeing plane. Woo Hoo! How cool is that!? So the first step is a gratitude piece, find things that remind you that life is good. The second step is a choice. I want you to choose happy, think happy. Remember that if you want to enjoy your life at home and especially your life at work, part of the equation is deciding that you want to enjoy your time at Boeing. So either that has to be a conscious decision, do you want to have a good time or not? I’m thinking you do. I want to make sure you make that conscious decision. Now finally, there’s an active piece. 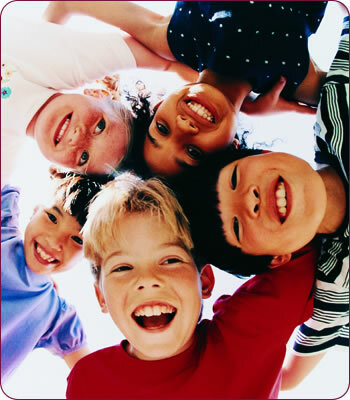 You’ve got to be physically active in doing something that creates levity, light-heartedness, joy, humor, fun at work. So I don’t know what this means for you. Maybe it means you really do put a magnet in your coffee cup and drive around St. Louis or maybe it just means you make a point to bring some humor to work. You play at work, you put a clown nose on, I don’t care, do something. Whatever it is, do something. Finally, I just wanted to remind you how much I appreciated being part of it. It was very cool to be in the Boeing building with you guys in St. Louis. It was very fun to be your motivational speaker, but the coolest part was watching your faces start from kind of serious and busy and over-worked and end where you ended just feelings to go. You people deserve it, you’ve been working hard. Life has not been easy lately and I know you guys work hard at Boeing, you deserve to really enjoy it. So find happy, choose happy, act happy. There’s more stuff at Bradmontgomery.com including a bribe. All right, so here’s the bribe, if you leave a comment, there’s a button, I don’t know where the buttons are. Look down, there’s a button and leave a comment and tell me what specific thing are you doing or thinking differently based on our time together. If you tell me what you’re doing or thinking differently, what I’ll do is I’ll send you a gift. No, it’s not a Ford Explorer. No, it’s not a space shuttle. But it’s cool and it’s my treat and all you have to do is leave a comment and tell me what you’re doing differently based on our time together. All right, thank you so much, if you have any questions or comments let me know. You can contact me through the website right here Bradmontgomery.com and really thank you so much, just an absolute pleasure to be part of it. Have a great day Boeing. Thanks Admins. A How-To video series about how to be a motivational speaker. 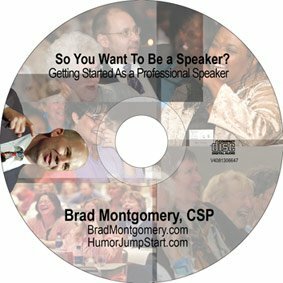 In this very informal video in which Brad Montgomery — a funny motivational speaker — Brad asks his pal and fellow motivational speaker and Colorado speaker Fred Berns for a killer tip for folks on their way to being a paid professional speaker. He has some great advice about getting deep with one industry. Interested in learning how to use humor in your presentation? Check out Brad’s Got Mirth: Milking Your Presentation for all the Humor It’s Worth. Learn more about how to be a motivational speaker with my how-to audio here. How To Be Speaker (3) Format of a Keynote. A Template! 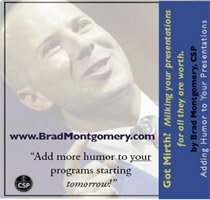 Brad Montgomery: Hi, this is Brad Montgomery from bradmontgomery.com with the continuing series about how to be a motivational speaker. So, I know you want to be a motivational speaker. You don’t know how. You want tips. Well, I don’t have them all, but I’ve got friends who have them all. We’re here with Fred Berns, one of the top speakers in Colorado. He speaks on a million things, including sales. Fred, can you give the listeners what’s it going to take to be a motivational speaker? Fred Berns: Well, I think to be a successful motivational speaker, it’s very important to have a specific niche. I think a niche can make you rich. And if you can zero in on a certain type of group, a different kind – a certain type of industry, I think you become viewed as an instant expert a lot more quickly. You can sell books and products a lot more successfully. You can be booked more often with, for larger amounts of money if you become the number one name in a specific industry. So, I think the key here, Brad, is to niche because it can make you rich. Here’s a really cool testimonial from my peeps at the Southern Farm Bureau Casualty Insurance. It feels nice to speak for a client and know their happy afterwards. Thanks for taking the time, Kenneth! uplift the spirits of our people with a tailored presentation. It picked us a little bit and some of the challenges we have in the workplace. But it helped us take these challenges and we’ve taken back with people who better uplifted spirits now. And can meet the challenges of the workplace with a better attitude. That reflects in productivity. Well, one of the missions of this particular conference is for our people to have a chance to socialize with each other, to get to know their peers from the other states that they don’t get a chance to see everyday but they talk with them. And so it was a great opportunity for them to laugh with their peers to build that rapport. We’re an insurance company too, much like AIG. And with the issues of AIG you know we’re looking for productivity. And productivity is a lot better when you have people who are smiling, has a ‘can do’ attitude. Yes, you might be shopping multiple people but we had a referencing from our sales organization to use Brad Montgomery. And of course sales people are very outgoing people. So when we look at people like IT, accounting, human resources, and lawyers, you really need someone who can pick up the spirits of these people. Aw Shucks Kenneth. It was my total pleasure. Insurance Speaker, Georgia Speaker, Fan of Farm Bureau! https://www.bradmontgomery.com/wp-content/uploads/2018/11/logo-1-495x198-1-300x120.png 0 0 admin https://www.bradmontgomery.com/wp-content/uploads/2018/11/logo-1-495x198-1-300x120.png admin2010-04-05 16:04:452010-04-05 16:04:45How Do You Know if Your Speaker Is Any Good? She had the kids giggling at #5. What a great teacher! What I love is that this awesome teacher definitely had as much fun as her kids did. She took the lead in CREATING fun and joy in her work day. She had fun… and because her kids had fun she is a better teacher. My point: having fun at work makes you better at work. Just ask my kid’s teacher. Do you need a funny speaker for your meeting (and want to skip the spelling test?) Contact me here! PS. She also gave them a Word Search in which none of words to be found were actually in the letter grid. Brilliant!